Confused on what to see and do while in Chicago? It goes without saying that the Windy City has it all; from food, history, architecture, culture and beyond. Combine them all by tantalizing all of your senses with a 3 hour small- group walking food excursion lead by a professional guide. You'll indulge in 5-6 of Chicago's quintessential staples while feeding your mind with intriguing and memorable tidbits along the way. Before you know it, you'll feel like a local. Make sure to come hungry, this tour offers more than enough to be considered lunch. The Amazing Local Flavors of Chicago Food Tour experiences the beauty and history of Chicago’s Gold Coast and famous Magnificent Mile while indulging in local and unique eats along the way. This professionally guided walking tour includes 6 different food tastings which provide more than enough for lunch (please be aware that restaurants/stops are subject to change due to unforeseen circumstances). Pizano’s Pizza – Experience the Chicago tradition of deep dish pizza! Pizano’s is part of a family of pizza pioneers that have been serving “world famous gourmet deep dish pizza” for over 60 years. Chicago Kernel - Chicago Style Popcorn that makes your stomach growl from just the smell! You might not leave with JUST your Tastebud sample! More Cupcakes — These hand crafted cupcakes are made from the finest ingredients. Patty Rothman creates one-of-a-kind flavor combinations with the perfect frostings, and garnishes good enough to eat on their own. Your cupcake is waiting! 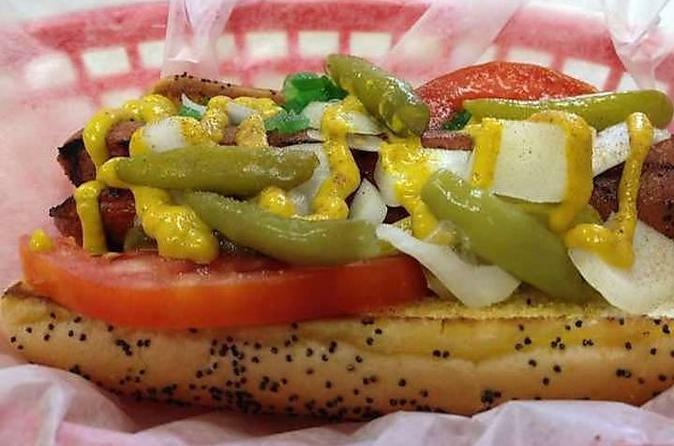 Downtown Dogs – Enjoy a delicious and classic Chicago Style Hot Dog just a block off the Magnificent Mile. Learn how we “drag it through the garden” here in Chicago, without the ketchup. Billy Goat Tavern Grill – Originally established in 1934, this tavern became nationally famous when it inspired Saturday Night Live’s, ‘Cheezeborger, cheezeborger, cheezeborger!’ skit starring John Belushi, Dan Akroid and Bill Murray. Since then, this Chicago institution underneath Michigan Avenue has been visited over the years by the likes of Mike Royko, Julia Child, Bill Murray and Anthony Bourdain. Fannie May – Enjoy a tasting of several chocolates here at Fannie May, and find out why they’ve been a Chicago favorite and household name for over 90 years.